Amateur private investigator Ash McKenna's time is about to expire--on his visa, that is. Having fled the demons that haunted him in the U.S., Ash has been laying low in Prague for nearly three months. Now, it's time to move on. But as he contemplates his next stop, a man named Roman appears, claiming to work for the U.S. government, and possessing intimate knowledge of Ash's many sins. Sins nobody should know. Roman offers to protect him...in exchange for a favor. It sounds simple: a bank employee named Samantha Sobolik is set to receive a package containing covert information in a handoff on the Charles Bridge. Ash must intercept the package, and deliver the contents to Roman. Ash refuses--until Roman threatens to kill his mother. Out of options and too far away to protect her, Ash agrees. But when Ash gets to the bridge, he discovers that the handoff is actually a hit. Ash ends up battling a mysterious and deadly assassin in a fight he barely survives. As it turns out, the job is far more complicated and dangerous than anyone thought. Ash finds himself in a strange city, outmatched, hunted, and trapped in a dangerous game where nobody is what they seem--including Samantha. 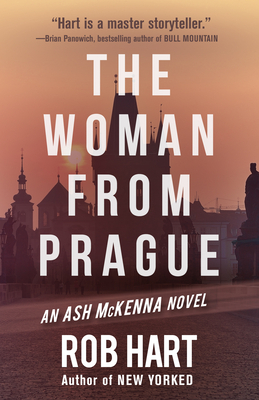 The Woman From Prague is a riveting novel of international suspense from one of the very best crime writers working today. Rob Hart is the author of three acclaimed previous Ash McKenna novels: NEW YORKED, CITY OF ROSE, and SOUTH VILLAGE. His short stories have appeared in publications like Shotgun Honey, Thuglit, Needle, Helix Literary Magazine, and Joyland. He has received both a Derringer Award nomination and honorable mention in The Best American Mystery Stories 2015. His non-fiction articles have been featured at LitReactor, Salon, The Daily Beast, The Good Men Project, Birth.Movies.Death., the Powell's bookstore blog, and Nailed. He lives in New York City. Find him online at @robwhart and www.robwhart.com.